Nagid (chief) of the Egyptian Jews, which office he inherited from his ancestors. He flourished at the end of the eleventh century and is known to have died before 1112. He took a prominent part in the Messianic movement of the year 1096, which assumed significant proportions. The first Crusade for the possession of the Holy Land was then in progress, and was considered by the Jews of that day as the harbinger of a new era. The Jewish community of Nablus, in Palestine, indeed, addressed a formal letter to Rabbi Abiathar, asking for positive information concerning the matter. The answer, together with the inquiry, was sent to Constantinople, the center of the Messianic agitation of the time. 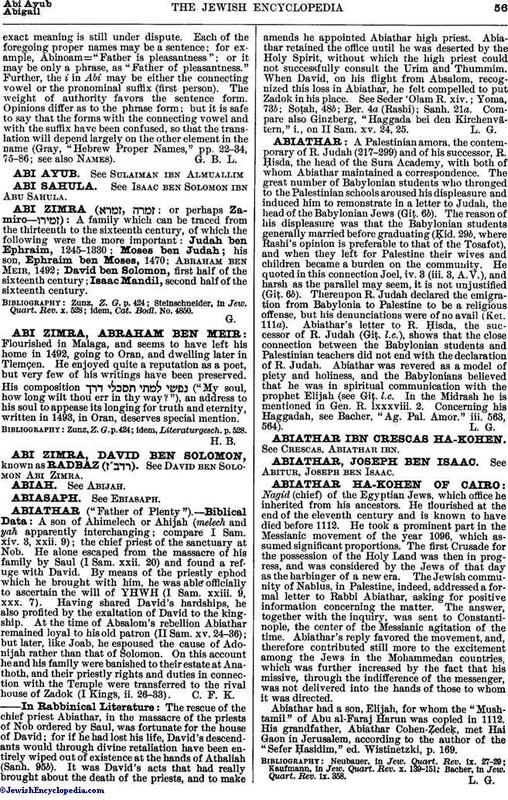 Abiathar's reply favored the movement, and, therefore contributed still more to the excitement among the Jews in the Mohammedan countries, which was further increased by the fact that his missive, through the indifference of the messenger, was not delivered into the hands of those to whom it was directed. Abiathar had a son, Elijah, for whom the "Mushtamil" of Abu al-Faraj Harun was copied in 1112. His grandfather, Abiathar Cohen-Ẓedeḳ, met Hai Gaon in Jerusalem, according to the author of the "Sefer Ḥasidim," ed. Wistinetzki, p. 169. Bacher, in Jew. Quart. Rev. ix. 358.